Dear March — Come in ? Marvelous. Praise as slight as blame? how ponderous is that? To slide from one month to another comfortably, I imagine. Ah yes, March as a gentleman caller . . . I picture myself as April locked outside the door; March makes me jealous. 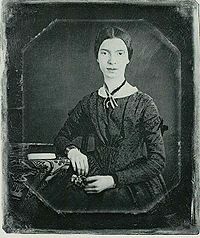 Oedipus would understand as we are all the progeny of Emily Dickinson's pristine precision and Walt Whitman's wild exuberance. What an inheritance we share!